Looking for a bedding solution for your crowded apartment? Try a murphy bed! Thanks to Moddi, everyone can have a modern, sophisticated, loft-style murphy bed of their own. The catch: you have to make it yourself using Ikea parts. But don't fret. According to reviews from people who have actually put a Moddi bed together, it's pretty darn easy and perfect for beginners. First, go to Moddi's website and purchase the DIY instructions for $8. The instructions are packed with awesome illustrations and straightforward directions (unlike Ikea's). Take your parts list and head to Ikea to purchase your parts. Any tools or hardware you can't find at Ikea can be found at your local hardware store. While Moddi quotes a price of $275 for a twin bed and $375 for a queen, you can go even cheaper by shopping the As-Is section of Ikea or finding used Ikea stuff online. One of the main components of the Moddi bed is Ikea's Lack coffee table which you can find a gazillion of on craigslist. After gathering your parts, follow the Moddi instructions to put the thing together and, Voila, you've got a bed! If you don't want to shell out the $8 for instructions, you can still get the parts list for free from Moddi, you'll just have to figure out how to put it together on your own. 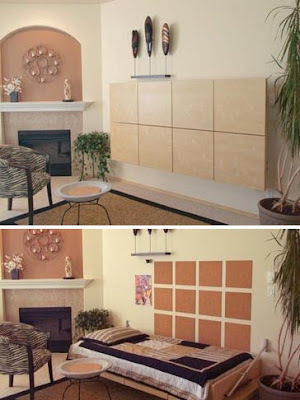 For those of us who rent, the Moddi murphy bed WILL put holes in your wall, however, they're nothing a container of spackling can't fix when it's time to move out. I'll be trying this out soon in my workroom...I'll let you know what happens! I found your blog a few weeks ago while searching for DIY murphy beds and decided to go for it! I just finished and LUV IT! Thanks for posting it. Always glad to have a new reader! Be sure to send in pics of your bed, I can't wait to see how it turned out!! have you completed your Moddi bed yet? I am looking for comments/photos from people who successfully completed the project since I am very interested in building one myself! Sorry, I haven't made my Moddi bed. I'm moving this summer so I'm putting the project on hold until I get to the new place. I'll do some research for you and do a follow up post with pictures and stories from others who HAVE made the bed. Everyone loves the Moddi!